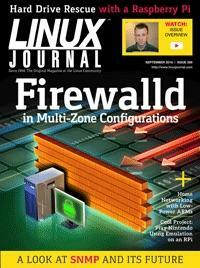 Discover the power and flexibility of zones in firewalld. Learn how you can trigger a chain process to recover a failing hard disk. If you like what you read, consider subscribing! Linux Journal is delivered to your inbox each month as a PDF and ePub, also accessible to subscribers from our Android, iPhone and iPad apps. Thank you for your support!